The Astana Graves are a series of underground tombs located 6km from the ancient city of Gaochang, and 42km from Turpan, in Xinjiang, China. The tombs were used by the inhabitants of Gaochang, both commoners and locals, for about 600 years from 200 AD - 800 AD. 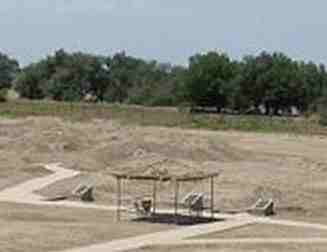 The complex covers 10 square kilometers and contains over 1,000 tombs. Different plots for separate castes and families are marked by gravel dividers. Due to the arid environment many important artifacts have been well preserved at the tombs, including natural mummies. 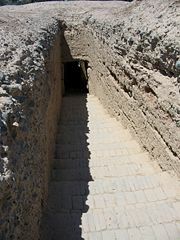 A typical tomb is entered by a 10 meter sloping staircase. The tombs are not very large, usually only 2 meters high. Some tombs also have murals inside. The deceased were laid on a small raised platform in the back of the tomb, surrounded by possessions and even food. Their faces were covered by cloths, some of which have distinct Persian motifs. A small funeral brick was placed to next to each body, on which was written the person's name and other biographical information. These bricks have been incredibly useful for historians to date the tombs' finds. A new pavilion has been built outside the old graveyard. The centerpiece is a large statue of Fuxi and Nüwa, based on the silk banners found on the inner ceilings of the tombs. This page was retrieved and condensed from (http://en.wikipedia.org/wiki/Astana Graves) see Wikipedia, the free encyclopedia, November 2007.